Today, we’re adding a quilted neck strap to our zakka cell phone case. That’s right, we’re going hands free. Yesterday on QUILTsocial, we created a sweet and stylish cell phone case that ticks all the zakka style boxes. Made of natural cotton/linen fabric, and designed to tote around an essential piece of life, our pretty practical case goes hands-free today. I found two old fashioned stocking (garter) clips in my extensive vintage button collection. I decided to use them as a means of attaching the strap to the case. You can substitute small D-rings or craft rings. 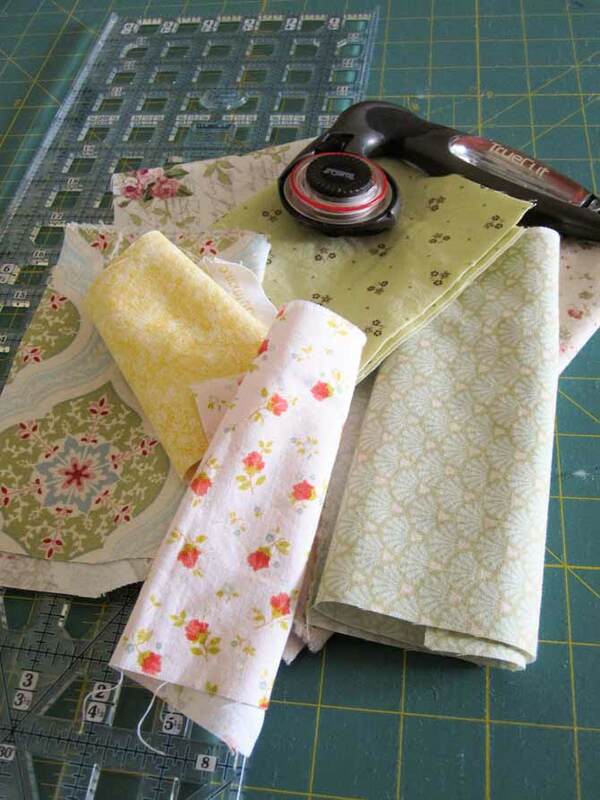 Collect your pretty scraps and cut them into 2″ wide strips of varying lengths. Once the scraps are cut into 2″ wide strips, press them well with steam to ensure they are wrinkle free. Use a rotary cutter to cut the scraps evenly. 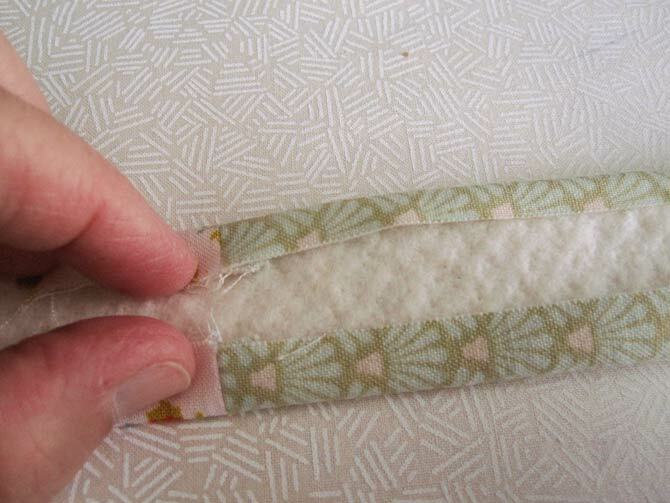 Sew them together with a 1/4″ seam. 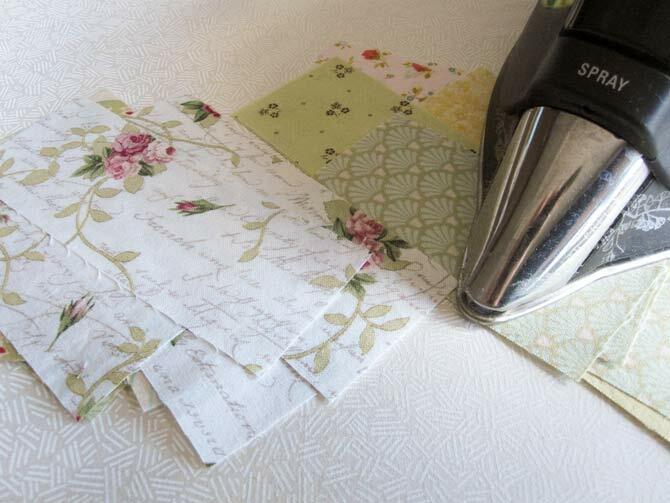 Spray baste the batting to the center of the pieced patchwork, using an applique sheet to protect the table surface. Fold raw edges to the center. The adhesive on the batting will help keep the edges even against the batting. 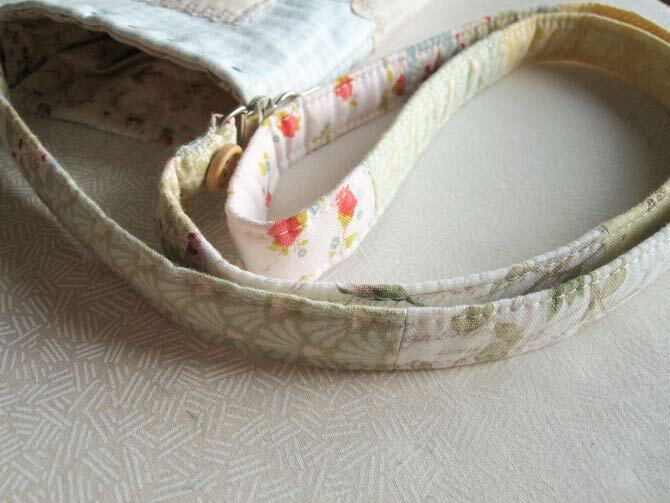 Fold the patchwork strap in half lengthwise and press to create a center crease. 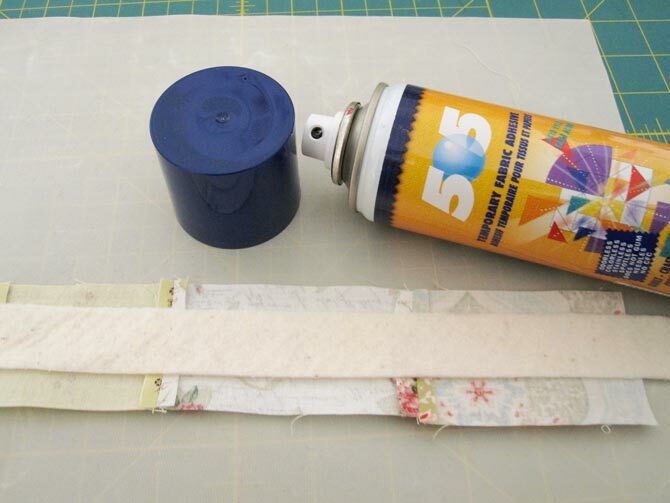 Open the strap, place it on the applique sheet and spray it lightly with 505 reposition fabric adhesive. Press the batting strip along the center crease. Lightly spray the batting. Fold the raw edges of the strap along the batting as in the photo. 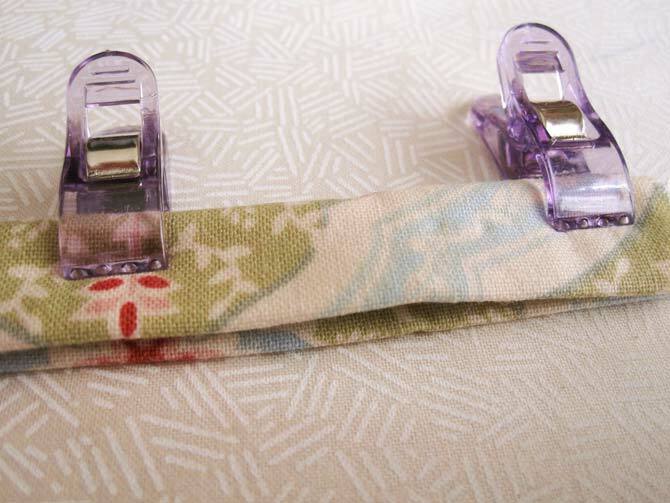 Clever Clips will keep the patchwork strap together in preparation for the top stitching of both edges. Fold the strap in half again, and use Clever Clips to anchor the resulting strap. Top stitch 1/8″ away from each edge. Remove the Clever Clips as you sew. Thread the strap through the garter clip (or d-ring). 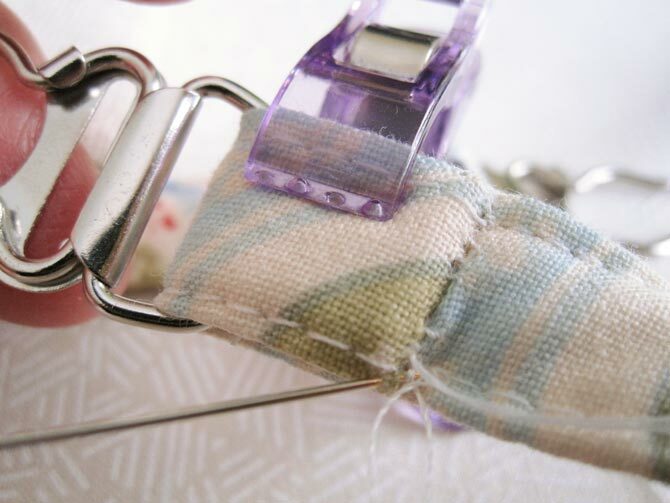 Fold under the raw edge and slip stitch it close to the clip. Repeat for the other side of the strap. Sew a small wooden button to the strap for some extra zakka style. Use Sew Smooth thread conditioner and Gutermann quilting thread for a strong finish. Add a small wooden button to right side of the strap/clip combination, in the center of the strap. Hand stitch the clip to the side of the cell phone case, sinking the stitches as closely as possible into the side seam. Now, slip your phone into its stylish new zakka case, pop in your headphones, and enjoy handmade, hands-free communication. Come back tomorrow for our final lesson in zakka sewing. We’re going to wrap up the zakka week with some cute and practical ways to keep all those cords that tether us to technology tidy and organized. 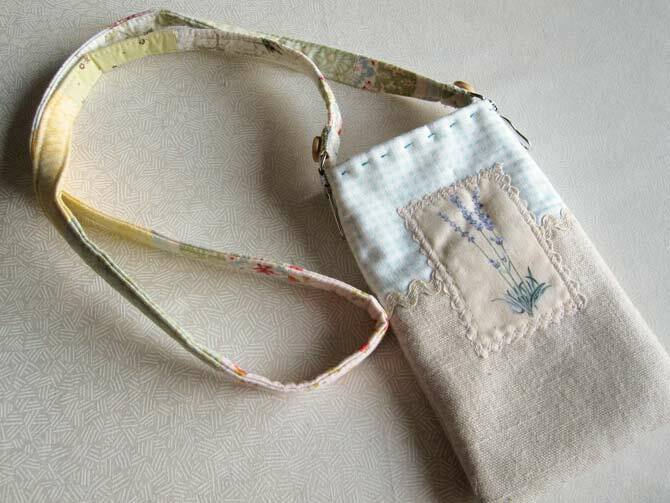 Until then, enjoy how your zakka cell phone case becomes “hands free” so you can sew and talk at the same time! Look, Ma, no hands needed to cart around your cell phone! Very easy , perfect for the beginner.